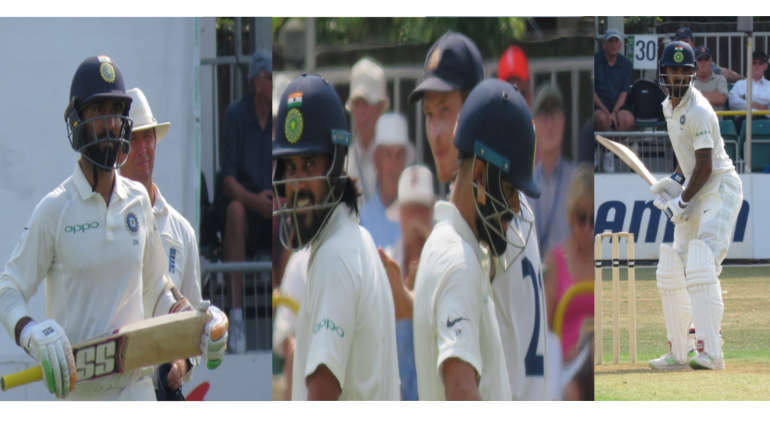 After India had a poor start in the warm-up match against England domestic team Essex, Kohli and co batsmen have made a strong comeback. When Top order batsmen failed to score yesterday, middle order showed some solid partnerships and made India reach 300 runs at the end of Day 1. While Dhawan, Pujara and Rahane failed to stay in the crease for a while, opener Murali Vijay and 5th batsman Kohli made a good partnership of 90 runs to get back India to the game. After the dismissal of both batsmen with half centuries, KL Rahul and Karthik started building next partnership that made India come to a solid position. After 114 runs of partnership, Rahul departed and Karthik (83*) and Hardik (32*) are in the crease at the end of Day 1 with a team score of 322-6 in the 3-day warm-up match. So far 8 batsmen have played to score around 300 runs and this cannot be trusted for the series since there will be no additional options after the top 5 batsmen fail to score. India still needs to work on the batting department to face the England bowlers in their pitch. Experienced players Pujara, Dhawan and Rahane not scoring are shocking while players like Rahul, Karthik standing as saviours is confident to see and we have to wait and see whether they perform in the important upcoming matches too.